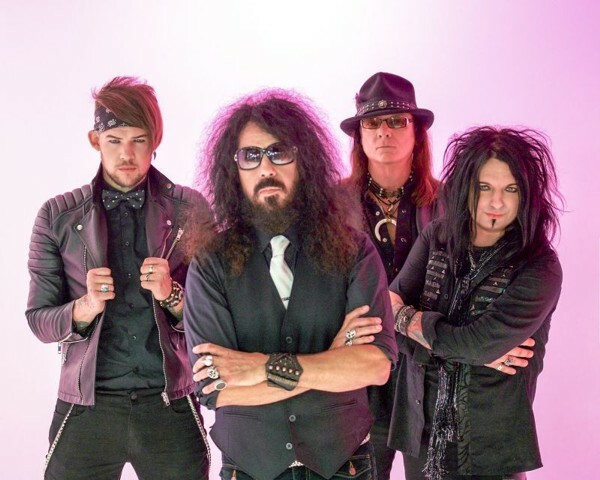 Quiet Riot are back with a raw live album 'One Night In Milan' and we have a nice chat with drummer Frankie Banali about it! The band was one of the highlights of the last Frontiers Rock Festival in Milan, where they shared the stage with names like Stryper, FM and Jorn Lande. A killer show with a memorable performance of singer James Durbin for the first Italian gig of the band, everything's now immortalized in a CD/DVD that really captures the brimming energy of a band living a second youth. Enjoy! I'm proud and happy to talk again with you! 'One Night in Milan'... and what a night: we were there, there was pure magic in the air and this DVD perfectly mirrors that atmosphere. Please, tell us something more about your memories of that Frontiers Rock Festival! Always so great to hear from you Fabiana! It was wonderful to finally meet you in person and thank you always for your great support of QUIET RIOT! Performing at the Frontiers Rock Festival was very special because I am well aware of how Frontiers Srl supports the Rock, Melodic Rock, and Metal community, so it was a pleasure for us to do so. For me personally to finally perform with QUIET RIOT live in Milan was a dream come true because of my Italian heritage and because I love Italy and the Italian people and culture. It was a challenge knowing that we were going to record the show live and especially not using any of our own drums and amps. Also, my position has always been with regards to a live record is that it should be a real and true live record, therefore I did not take the option to fix or add anything to the tracks. It is a true live record not a "live" studio record. I am very grateful to Maestro Alessandro Del Vecchio who I know, love and trust, and was in charge of overseeing the recording and mixing and producing the live tracks. Also, being able to finally meet you and my dear Primo Bonali who took great care of us while we were in Italy and of course the entire Frontiers Srl family — Serafino, Mario, Elio, everyone — made the visit complete. First time in Italy and first time with James Durbin the new Quiet Riot line-up seems to be a mean killing machine. Aare you satisfied with the 'Road Rage' world tour? QUIET RIOT has just started the 2019 tour cycle this past Saturday, January 19, in Scottsdale, Arizona for the first concert of the new year. Our last show of 2018 was on December 27 in Hollywood California, so you can see we only had 23 days off from the end of 2018 touring and starting up again on January 19th! James has now started his second QUIET RIOT year and we have a great number of concerts already booked for 2019 as far as October 2019 and more on the way. One of the most touching moment of 'One Night in Milan' is during 'Thunderbird', with Alessandro Del Vecchio. What about your feelings in a so deep moment? What truly made this particular performance of 'Thunderbird' even more special is that I had asked Alessandro Del Vecchio if he would be interested in playing piano on 'Thunderbird' live which he gladly accepted. When QUIET RIOT originally recorded the song in the studio in 1982, it had piano in the intro and throughout the song. But performing it in Milano at the festival was the first time we have played the song as originally recorded with piano in 36 years! A once in a lifetime moment and performance for us and for the fans present. My sincere thanks once again to Alessandro for a masterful performance! Bravo! We can see how moved all of you were with the entire club shouting and calling back the band on stage at the end of the show... there's a little came back missing on this video. Can you tell us about the very last song you played on stage that night? We had not planned to play an encore song because I wanted QUIET RIOT to play as many songs possible given the time we were allowed for the set. But once we finished playing, the love and response from the fans at the festival prompted me to asked the band to wait a second while I asked Don Primo Bonali if it would be possible to play just one encore song. Primo, understanding that the audience wanted and deserved one more told me we could. It is very difficult to play any song after the iconic QUIET RIOT anthem 'Metal Health/Bang Your Head' and therefore I chose to play another great anthem, AC/DC's 'Highway To Hell' which QUIET RIOT recorded on the 'Alive and Well' record in 1999. It was a stellar way to end a stellar evening! Last question is mandatory: are you working on a new album and are you planning to come back soon in Italy? I am already deep into the recording process. It has always been very important to me personally and for QUIET RIOT to continue to write and create new music no matter what anyone else is doing or not doing and regardless of how the music industry has changed. At present all the master drum tracks, master bass tracks and master guitar tracks have been recorded. I recently gave James all the rough mixes to all of the newly written songs for him to start the process of writing lyrics. Following that we will record master lead and background vocals, then engineer Neil Citron and I will begin the process of mixing the tracks and them mastering. I also plan to make a new music video as well. Even album artwork has already commence the early stages of creation.There is no timeline at present for either of these releases.